There has definitely been a canine and feline theme running through our RTG and RYTG activities this Summer. Starting with our 2014 AGM meeting which took place on June 4th. This year’s Betty Kirk Award went to Daniel Barrow for his performance as Felix, the attention-seeking, good-looking, refusing-to-be-trained french poodle from ‘Beauty & The Beast’. 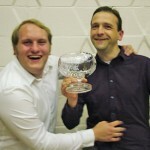 In the year that Betty sadly passed away and the year that saw the successful return of the RTG Panto, it was very fitting that the coveted award should have been won by a Pantomime performance. 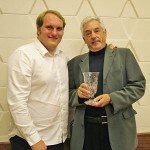 This year’s Founder Member’s Trophy was deservedly won by Patrick Kelly for taking on the difficult role of Treasurer, for his hard work as our Box Office and for his skills behind the camera. Jump ahead to July and it was a Cat that stole the show at our RYTG 10th Anniversary Celebration – a violin-playing Cat to be exact. 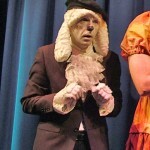 The title character in the play ‘The Cat & The Fiddle’ which was a major part of this hugely enjoyable evening. 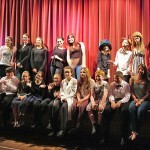 For more details and fun photos from this milestone event please see our Youth Theatre page. To round off our Cats & Dogs theme, rehearsals are well underway for our next production – the Sherlock Holmes classic – ‘The Hound of The Baskervilles’. Coming to Ravenshead Village Hall on 2nd, 3rd and 4th October 2014. Go to our Upcoming Production page to learn more!